The sopranos that conquer Lucia's stratospheric notes are some of the greatest the world has ever seen. Jessica Pratt has joined the ranks of Nellie Melba and Joan Sutherland: one of just three Australians to sing the role on the hallowed La Scala stage. 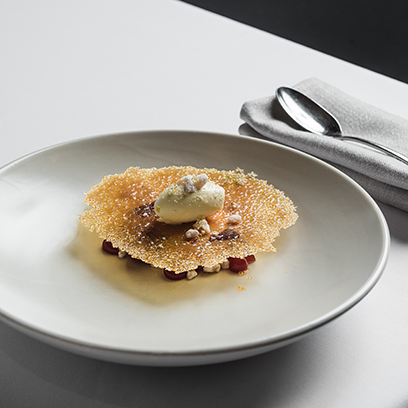 And now, Jessica Pratt is following in Dame Nellie Melba's footsteps in more ways than one, with Maggie Beer creating a dessert in Jessica's honour to mark her debut at Sydney Opera House: La Dolce Jessica. When Dame Nellie Melba was at the height of her worldwide fame in 1892, legendary French chef, Auguste Escoffier of the Savoy Hotel, created a dessert in her honour, especially for a dinner party held by the Duke of Orlèans: the Peach Melba. La Dolce Jessica is a deconstructed trifle, with a lemon curd base, fresh raspberries, and raspberry jelly, crystallised macadamia nuts, an Amaretto crumb, and toffee tuile. Maggie Beer has also shared a version that you can make at home. Note: this recipe needs to be prepared a day ahead. 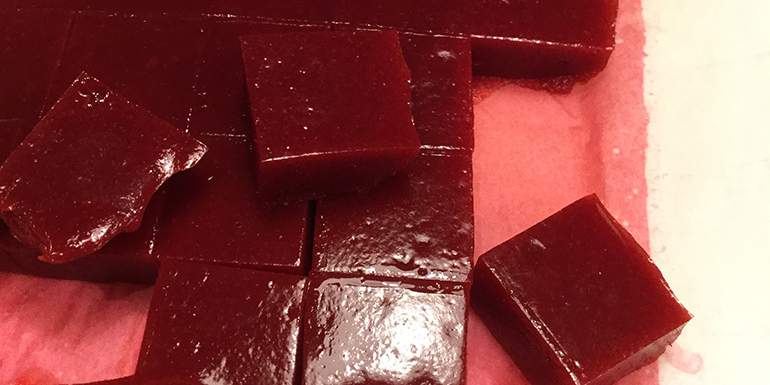 Once the raspberry jelly has set overnight in the fridge, cut it into cubes. Add the egg white mixture to the almond mixture, using your hands to bring mix them together. Wet your hands and dip them into the granulated sugar, then roll the dough into tablespoon-sized balls and place on the prepared baking tray. Bake for 20–25 minutes or until golden and crisp. 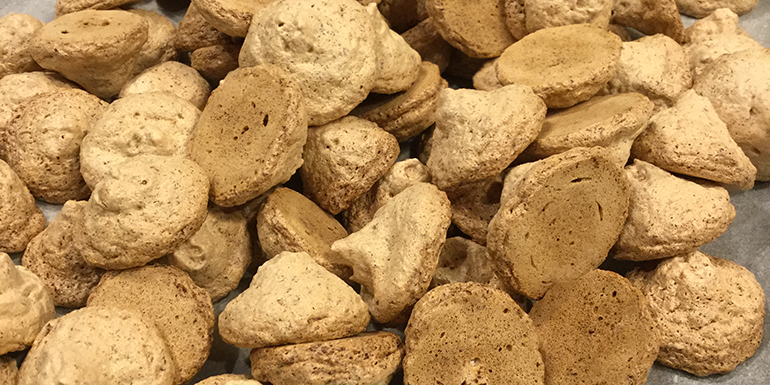 Double or triple the amaretti recipe to enjoy these Italian-style macaroons with a cup of tea. Transfer to a heavy-based stainless steel saucepan and add all remaining ingredients. Place a round of baking paper on the surface to prevent a skin forming and cool in the fridge. Note: the lemon curd can be made in advance. When the mixture has thickened, pour the warm curd into a hot, sterilised jar, seal, and store for up to three months. 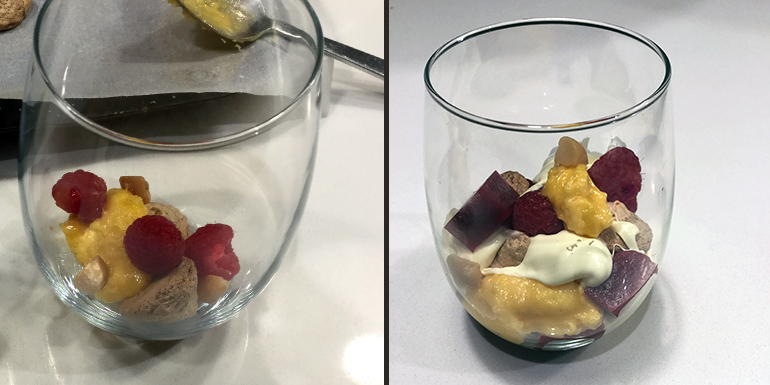 Add two amaretti to a glass or small bowl, then two raspberries, with a teaspoon of lemon curd, and a scattering of toasted macadamia nuts. Add a few dollops of double cream and two cubes of the raspberry jelly, scatter more toasted macadamia nuts and fresh raspberries, and add another teaspoon of lemon curd. Assembling the dessert: layer each of the ingredients in a glass or a small bowl. 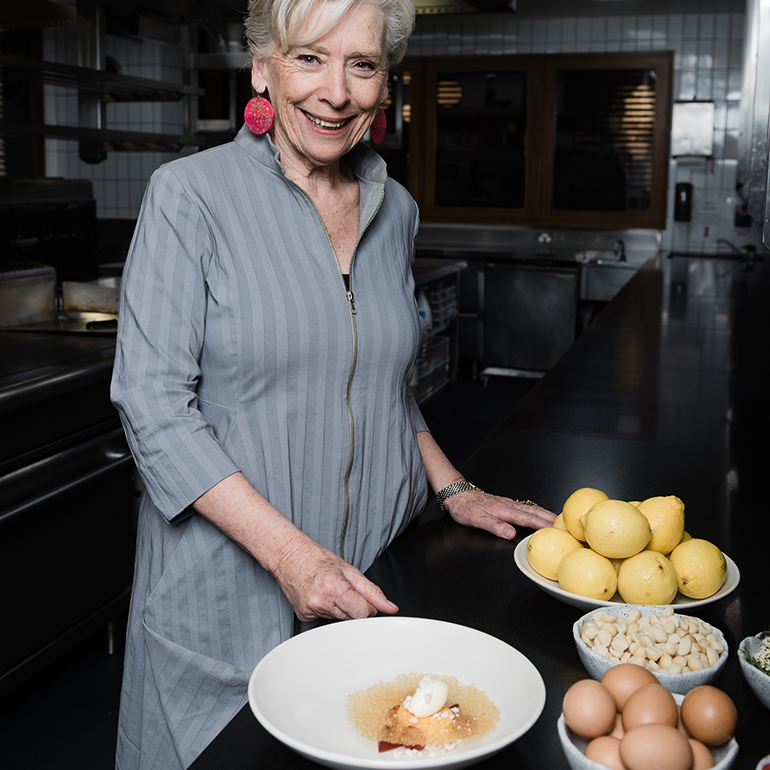 Maggie Beer makes the restaurant-version of La Dolce Jessica in the kitchen of Matt Moran's Aria Restaurant. La Dolce Jessica at Aria Restaurant, Sydney.